$1,299.99 Seen a lower price? $1,629.98 Seen a lower price? 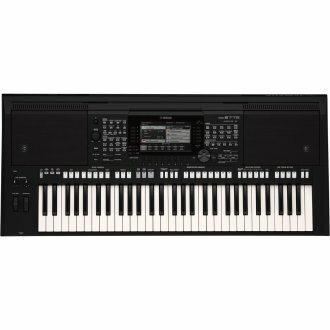 The Yamaha PSR-S775 has the right balance of professional features and controls to inspire the serious musician to play, compose and arrange without breaking the bank. It's the first in the Arranger line to offer mic/guitar input with effects, 7" color display, Super Articulation Voices, MP3 playback with lyric viewer and a generous 280MB of ROM storage that can hold multiple expansion packs for quick change on the fly. Everything you need is built-in making it easy to capture, edit and playback your creative ideas. - Wireless audio & MIDI features utilize Wi-Fi to stream audio and MIDI to/from your iOS device and your Yamaha instrument to integrate with compatible apps for iOS. - MP3 Lyric Display allows you to read the lyrics MP3 songs that have lyric data attached, including thousands of karaoke titles. - Assignable real-time control knobs allow you to filter and adjust your sound just like an analog synthesizer. - Accompaniment Styles add a "backing band" to your performances while you remain in complete control of chord changes and arrangements. - The modulation wheel lets you control the amount of modulation effect on your sound, and will remain at the desired setting until you increase or decrease it again. - Voice & Style Expansion Packs enable you to customize your PSR-S series Arranger Workstation with a wide range of additional content from all over the world. - USB audio recording and playback captures or plays back performances on a USB drive. - DJ Styles are preprogrammed with chord progressions leaving your hands free to play melodies or tweak the real-time control knobs. - The 16-track song recorder/player lets you create full arrangements or play back songs. - MegaVoices feature various playing articulations, techniques and performance sounds and are used in accompaniment Styles to provide ultra-realistic expression. - Performance Assistant Technology (P.A.T.) lets you focus on playing the rhythms while the instrument worries about playing the right notes of MIDI songs. - Featured Voices: 76 S. Art!, 23 Mega Voices, 28 Sweet! Voices, 64 Cool! Voices, 81 Live! Voices, 20 Organ Flutes! Available until 11 PM (EST) today. Mention special code 20J-N8SC when you call.